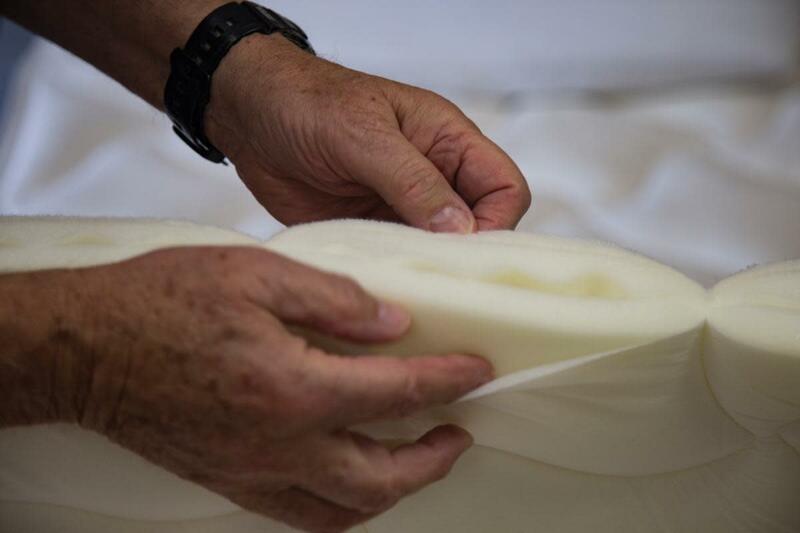 Not all soft good foam is created equal. Quality is key. 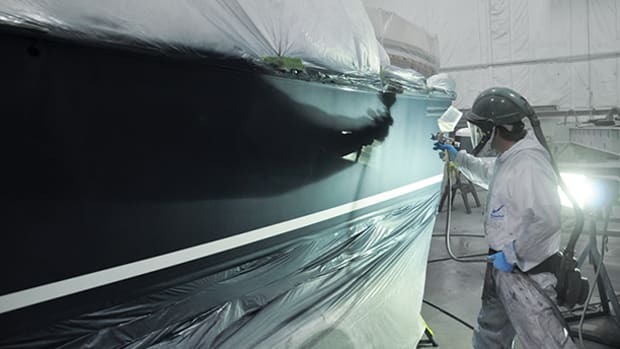 Does your boat need a makeover? For an easy update, upgrade the soft goods. I didn’t write those lines. I’m not a private detective and I don’t own a suit. You’ve just been reading the opening paragraph of Raymond Chandler’s The Big Sleep, somewhat edited. It’s Philip Marlowe in the suit. And while you might not believe that clothes make the man, Marlowe did. 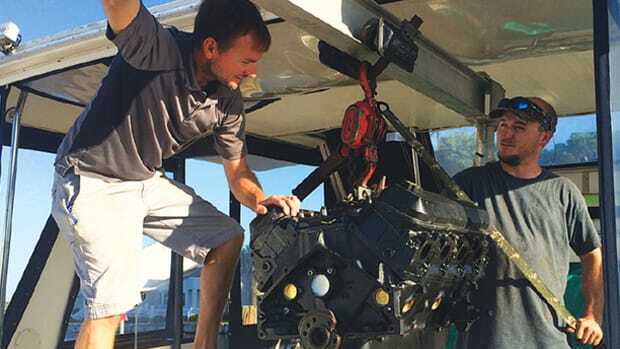 Clothes make the boat, too. If your vessel is looking a little dated lately, like she’s just tussled with a couple of gunsels, maybe she needs new duds. Replacing upholstery, cushions, and mattresses—not a suit, exactly, but what interior decorators call “soft goods”—will turn drab, uninviting accommodations into a warm and welcoming abode for practicing the social arts, or sweet-talking a dame whose sickly old man has a pile of cash. And think about how comfortable a new mattress will be: it’ll cost less, a lot less, than four million bucks, too. To pull off a top-notch soft-goods upgrade, you first need to know the territory, the world of foam and fabric. I don’t, but I know people who do, namely Fred Heine and his wife, Jane, who own Boatique USA (boatiqueusa.com) on the west bank of the Connecticut River in the blue-blazer-and-pink-pants town of Essex, Connecticut. Working from a 100-year-old brick building that used to be a ship chandlery, the Heines sell, according to Fred, “custom bedding, upholstery, and ‘stuff.’” The “stuff” is décor items and accessories from functional to frivolous. Some you can find in other stores; some you can’t. Along with novelty flags, pet accessories for the seagoing dog, and other gewgaws, the Heines also carry Bottega crystal, bone china plates, fancy linens and towels, embroidered throw pillows with $200 price tags, and so forth. Nice stuff, but the real action, the action we’re looking for, happens in the back corner of Boatique USA. It’s where they keep the soft goods. 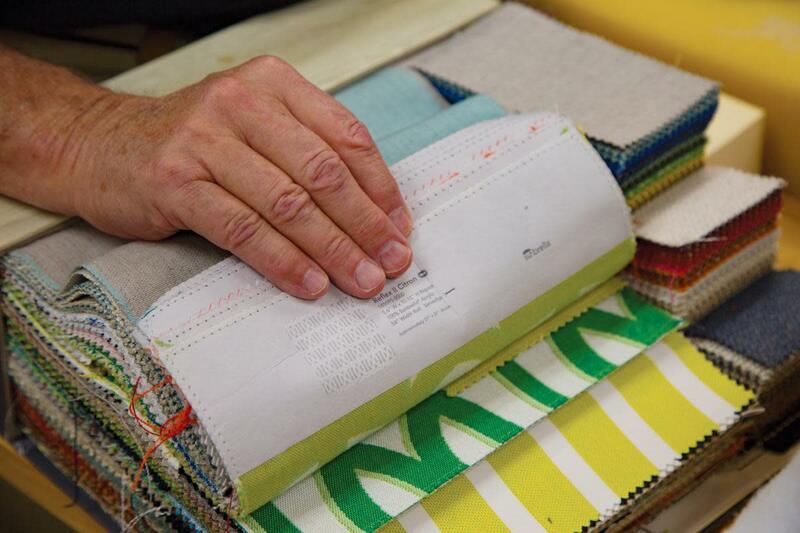 When most of us consider new upholstery, whether for boat or home, we think first of choosing a fabric, and the Heines have lots of swatches available, hanging from circular racks and bound into heavy sample books. 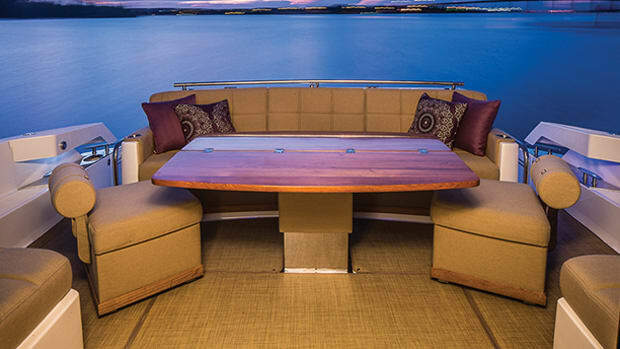 But you need something to put the fabric around, and in most cases that means foam, whether for settee upholstery, flybridge seat cushions, or mattresses. There are many kinds of foam, so choosing the right type isn’t as easy as you might think. 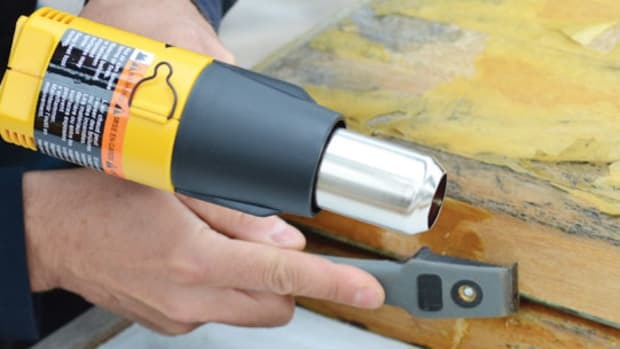 The most common foam is an antimicrobial, mildew- and mold-resistant polyurethane, available in different densities for different applications. Heine had samples that were as soft as packaging foam, others that were very firm, and several in between. Polyurethane is an open-cell foam that’s durable and comfortable to sit or lie on, but it holds water like a sponge if it gets wet. 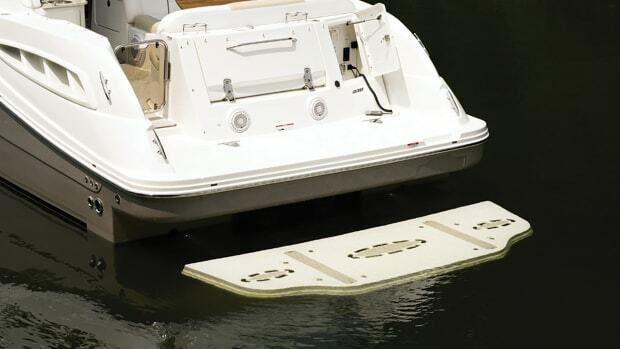 Heine recommends covering vulnerable mattresses with waterproof pad/protectors, like in V-berths, for instance, where a hatch might be left open. More on mattresses later. 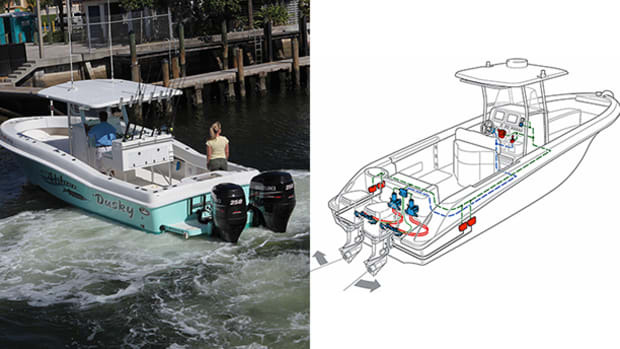 For exterior upholstery that will sometimes get wet—cockpit, flybridge, and foredeck sunpad cushions, for example—a drainable open-cell foam is best. Water and air will pass through easily, so it dries quickly. There are many brands of outdoor foam, most having some form of “dry” in their name. The Heines use Ever Dry; Dry Fast is another brand, and EZ Dry is yet another. Rather than cover the open-cell foam completely in decorative fabric, the Heines use Phifertex on the bottom or back of the cushions. Phifertex is a vinyl-coated polyester fabric, with an open weave that lets the water run out faster than it soaked in, so it works great with drainable foam. Phifertex comes in many colors and patterns, is treated with an antimicrobial, and can be used on its own to make cushions and upholstery; you may have enjoyed sitting on it around someone’s swimming pool, since it’s often used as seating fabric for outdoor furniture. Why not use closed-cell foam, which is waterproof? It’s too firm and not comfortable, said Heine, handing over a sample that was almost un-squeezable. It floats, so it’s ideal for throwable flotation cushions and PFDs, but not for upholstery, in Heine’s opinion. (Sailors often choose closed-cell foam for cockpit cushions that take a lot of abuse and get wet frequently from rain and spray.) Sometimes comfort is secondary to durability. Fred Heine with a custom-made mattress topper. Alongside the fabric samples, Fred Heine keeps an unmade bed in his showroom, a cheap, twin-sized mattress covered with a mattress topper. (Some people call it a pillow top.) Heine doesn’t sell the mattress, but he sells the topper. 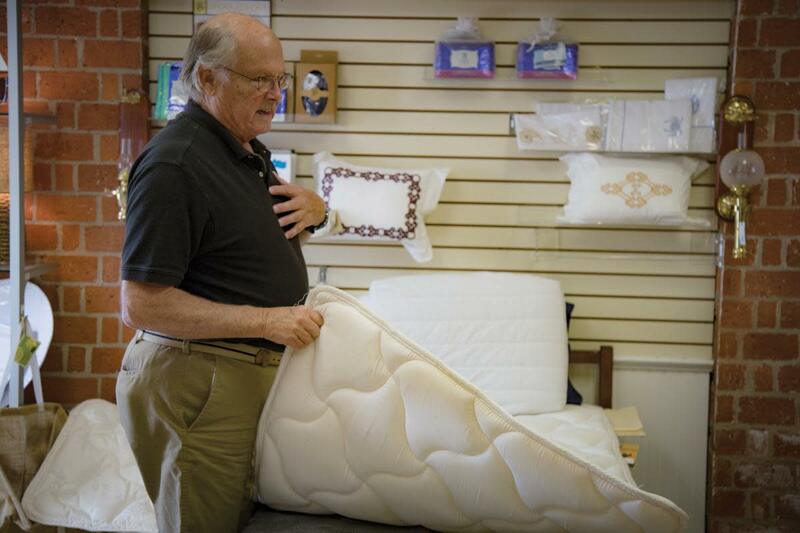 “It’s a way to make a bad mattress better,” said Heine, and for less than half the price of a typical foam mattress. (When I visited, Heine was charging $345 for a mattress topper, in any size or shape.) I tried the bed; the topper made it noticeably firmer. Heine’s mattress toppers are made of foam covered with a quilted mattress fabric, and are held in place by elastic straps at the corners. Each is custom-made to an owner-supplied paper template, by a shop in Connecticut whose name Heine will not reveal. Heine will spec a custom-made topper based on a template, and sends each customer a template kit after receiving a deposit. He guarantees the fit as long as there’s a template. 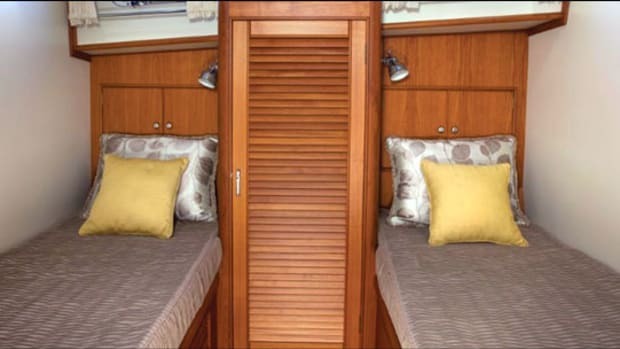 “You can’t rely on measurements,” he said, “because of radiused corners.” Buyers can make templates directly from a berth, or trace a mattress on the floor, then cut the template and check it on the boat. For V-berths, he said, template each side, and mark the templates carefully as port or starboard; often, the two halves of a V-berth are not exact mirror images of each other. Foam is expensive, so Heine recommends trying to reuse it when rejuvenating soft goods. “New foam can double the cost of a job,” he said, “and some of the the older foams are sometimes better.” Foam can last for 10 years, often longer. Replace foam if it’s moldy or mildewed, or turning to powder, but otherwise just recover it and use the money you save to buy a mattress cover and new sheets, maybe a bedspread, too. Oodles of book-bound swatches mean choices galore. Many sailors, especially long-distance cruisers, repair their own sails and make their own cushions, awnings, and so forth, so if you’re determined, you could give it a shot. There are many resources to help you, and to sell you the raw materials. 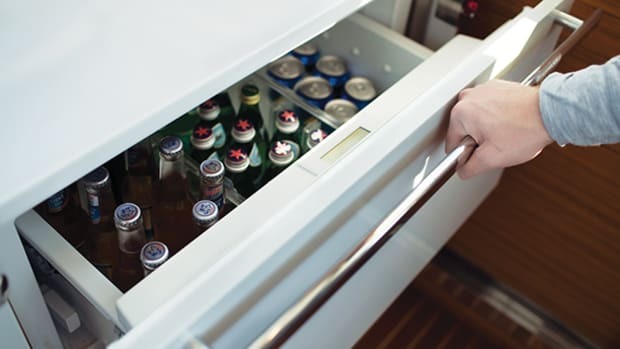 I’d start at Sailrite (sailrite.com), which offers lots of information and how-to videos on its website, along with most of the tools and materials you’ll need to do things yourself. There’s a nice intro to foam on the Sailrite website as well, including a flow chart to help you determine what foam to use where, and why. Sailrite sells the foam, too, along with lots of fabrics, including Sunbrella and Phifertex. (FYI, Pacific Blue Sunbrella costs $22.95 per yard, 46 inches wide.) So, while I think hiring a pro is the way to go when refurbishing your soft goods, there are resources out there to help you go it alone if you’d rather take that route. If you want to spend more—a lot more—shop fabrics from a “name” designer like Ralph Lauren. Heine showed me some RL fabrics that retail for almost $300 per yard. But they’re nice, and the Ralph Lauren Home website (ralphlaurenhome.com) has enough colors and patterns to satisfy even the most finicky interior designer. Most of Ralph’s fabrics in the outdoor category are solution-dyed acrylic, fine for boating applications. When shopping for fabrics, take someone along with better taste than you have, or rely on the seller to help. Jane Heine is an interior designer with years of experience, and can provide aesthetic assistance. Most fabric shops have someone on staff who can do the same. My advice? Match the fabric to the boat, not the owner. 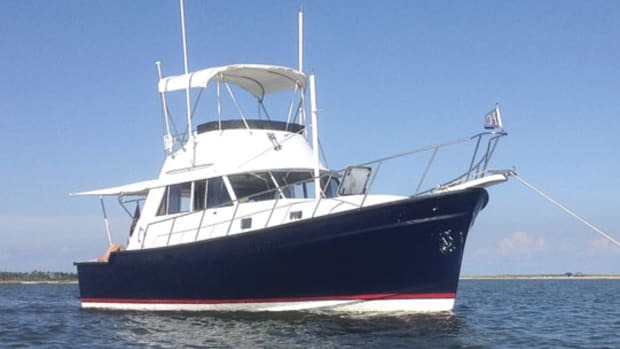 What looks great on a sportfisherman or European express cruiser probably won’t work on a classic New England lobster yacht. And steer clear of busy patterns, or you could end up with the seagoing equivalent of a hepcat in a zoot suit. And if doubtful, go with a boring fabric—Navy blue, say, with embroidered white anchors. Once you get used to it, it’ll look fine.